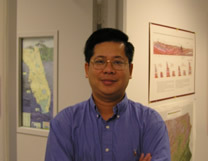 Dr. Tran is an environmental geographer and GIS/geospatial analyst. His primary research interests include integrated regional vulnerability assessment, the use of artificial intelligence (e.g., fuzzy set theory, neural network, and cellular automata) in geographic analysis and modeling. He has been in the core team of the U.S. EPA’s Regional Vulnerability Assessment (ReVA) program since 2000. He has developed various integration techniques, distance measures for ReVA. He teaches Geography 131 – Geography of the Natural Environment (I), and courses in GIS, quantitative methods, geospatial analysis, and integrated environmental assessment. For more information about Tran’s work in regional vulnerability assessment, visit the U.S. EPA’s ReVA web pages.